Remember what it used to be like to search for a house? You would hop in your car and cruise the neighborhoods, looking for those brightly colored signs that alerted you to the possibility of finding your dream home. Or, you would wait anxiously for the next edition of the local newspaper to see if anything new was listed during the week. These days, you can use technology on your house hunt to save time. Times have changed for those looking to buy a house. With technology at your fingertips, it’s easier to narrow down the choices, but you have even more tools at hand to make the home buying process easier. Finding a real estate agent is an important step when you’re starting your home search. While it’s a good idea to check with family, friends, and business associates for their recommendations, you can search online for details and testimonials when you’re choosing the right agent to fit your needs. With the touch of a button, you can learn more about their designations, awards, and experience. Wanting to do a bit of research before you head in for your mortgage loan pre-approval? Check out a Mortgage Calculator online to get an estimate of just how much home you can afford. No more trying to figure out the equations and doing the math yourself. Input a few details and get an estimate in a flash. Searching for houses has never been so easy to do! You can relax in your pajamas on the sofa, with a cup of coffee and your laptop, while you cruise virtual neighborhoods around the world. This is thanks for the MLS that connects real estate agents and properties for sale. Listings on websites will include photographs, prices, and details about the home. Some will include information on schools and businesses in the area. If you sign up for listings on your real estate agent’s website, you’ll get to manage these listings, save your favorites, and get updates right in your email box. You can still cruise the neighborhoods to look for available homes for sale, but you can grab your real estate agent’s app to give yourself the edge. Using the app on your tablet or phone, you can access information about any home you see during your search. Imagine being able to stand in front of a home of interest and access neighborhoods information, details on the house, and contact your real estate agent to set up a tour. Millions of homes at your fingertips. Now, that is power! No more rushing to the courthouse to look through dusty files in order to locate information on the house you’re wanting to buy. You can access public records online and find information about taxes or other details that may impact your decision to buy. There may be cases where a small fee is charged, but many records can be accessed for free. Most of us are well acquainted with social media outlets like Facebook, Twitter, and Google Plus. These are excellent ways to connect with your real estate agent and stay up to date on current home listings. There are numerous pages and groups that are devoted to local areas and homeowners’ associations. Plug in to those to get current information on the community and current events. Those who find themselves busy with work and other activities appreciate the speed with which we can communicate these days. No more waiting to touch base for phone calls or making appointments to discuss small details. Now, you can ask your real estate agent to send you a text when they want to communicate. Bits of information can be shared quickly. The home buying process is easier when you include technology as part of your plans. 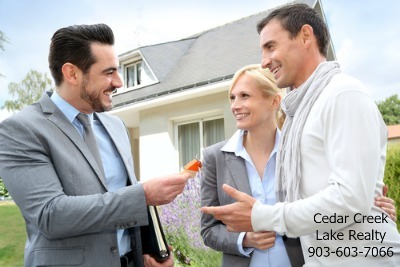 Give one of the Cedar Creek Lake Realty Team agents a call at 903-603-7066 to learn more about available homes for sale in the area.